April 2017. 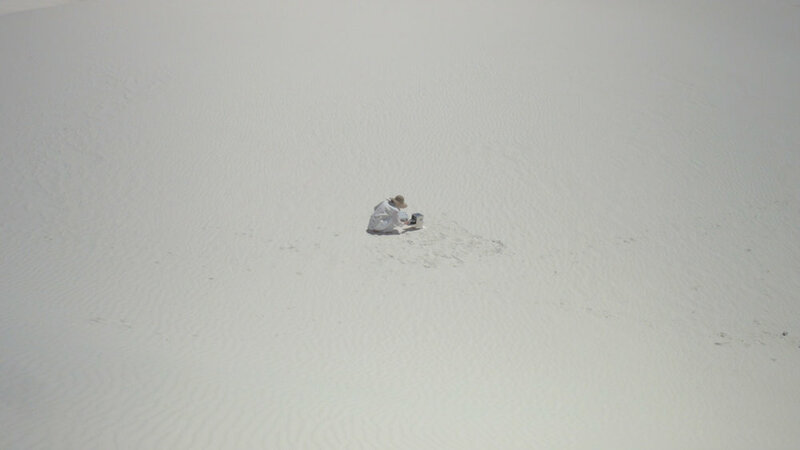 Field work in White Sands, New Mexico, USA. Born in Oslo, 1985. Live and work in Oslo. My artistic practice circles around existential questions as well as conditions and forces of nature that everything and everyone is subject to. How different materials behave under certain conditions is part of my examination. Just as all living organisms, materials are always subject to change; be it by the human touch, though interactions with their surroundings or by the dynamic life force of their chemical reactions. Interesting discoveries occur between the controlled and the incidental. My motion is rarely as along a railway line, striving toward a final goal, but is rather anti linear and full of digressions. I draw attention to that in the periphery of our vision, things usually left unnoticed. Through this process-oriented working method I investigate in a wide variety of materials and forms of expression such as objects, sculpture, installation, performance, video, photography and text. 2015-2017: MA of Fine Arts, Oslo National Academy of the Arts. 2012-2015: BFA Medium and Material based Art, Oslo National Academy of the Arts. 2005-2008: BA Fashion and Costume Design, Oslo National Academy of the Arts. 2004-2005: Kunst_Design Fagskolen, Søm og design, Folkeuniversitetet i Oslo. 2017: Unge Bærumskunstnere, Bærum Kunstforening. 2016: Respirasjon, Østlandsutstillingen, Akershus Kunstsenter and Oppland Kunstsenter. 2016: VEVE, Akademirommet, Kunstnernes Hus, Oslo. 2015: Nullstille P0, P0 Kunsthøgskolen i Oslo. 2014: Funnet og tapt, Galleri Seilduken, Oslo. 2013: En mann som drikker øl, Høstutstillingen, Kunstnernes hus, Oslo. 2012: Kuriositetskabinett 2, Wizard, Oslo. 2010: Domestic form, Galleri Format, Oslo.